Snowy and foggy. Did not open. Humid, snowy, cold. Did not open. Took some more Fabry-Perot test data and gain calibrations for RSS and SALTICAM. Others: Keith earlier in the night. Amanda and Henry for a visit later on. Cloudy, windy and rainy night. Did not open. Took some Fabry-Perot calibration data. - a front moving in made life very difficult. strong winds prevented good mirror alignments and clouds interfered with observations. we closed ~01:30 due to clouds. - struggled with weather conditions tonight even though it was clear. strong winds prevented good mirror alignments and at the end of the night we had very bad seeing conditions. closed a bit early when the seeing went over 3''. - lost the first part of the night due to mirror alignment issues. just after we got on sky, clouds came rolling in which forced us to stay closed for the rest of the night. - a clear and photometric night with variable seeing which fluctuated between 1'' and 3''. had some technical issues at the beginning of the night, but all ran smoothly afterwards. A 4 degree temperature difference between the 2m and 30m sensors meant bad dome seeing and therefore mirror alignments. - another good night with seeing staying mostly below 1.5''. had some mirror alignment issues which was mostly due to dome seeing. Today all of the smaller or more sensitive components of HRS left Durham to be air freighted to Cape Town. These consist of all of the optics, detectors, mechanisms, controllers, etc. 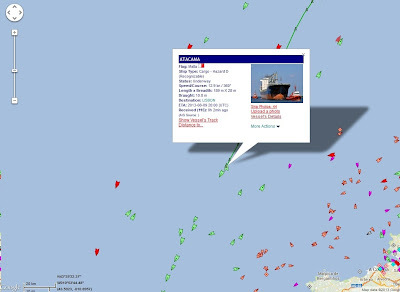 They should arrive early next week, ahead of the main shipment which left by ship earlier this month (see blog post on 8 Aug). The Durham team arrive on 1 Sep and plan to begin reassembly of the instrument at SALT during the first week of Sep.
- good observing conditions during the night. the number bright time targets are diminishing fast. we observed a total of 20 blocks for the evening, most of it was P4 observations. just above 1.5". Some tech. trouble in the beginning, but smooth after that. Others: Deneys, Jonathan. Francois & Hitesh on phone. More FP cals, but no on-sky observations. Denied first by high winds and then by humidity. Night lost to cloulds,high humidity. Did not open. More FP calibrations taken. Others: Deneys, Ted on skype. No observations, thick clouds and high humidity. Ran FP calibrations sequences.
. Stormy, icy night. We did not open.
. Closed by the end of evening twilight due to high humidity. Stayed closed because of humidity, high wind, and then clouds.
. Took a few frames at the night start to test the new focus model: 2011-2-RSA-001.
. Cloudy and wet night. Did not open.
. Dark night with moderate wind and clouds at the very end. We spent most of the first half of the night gaining knowledge on how to observe without an interferometer.
. Lots of focus testing, under propID 2011-2-RSA-001.
. Dark night, but we could not take science data because of a broken interferometer.
. Test frames taken for 2011-2-RSA-001 (an old SCAM commissioning code).
. Humidity above limits the entire night. We did not open. HRS is on its way! The bulkier components (e.g vacuum tank, optical bench) of HRS are now on the high seas! 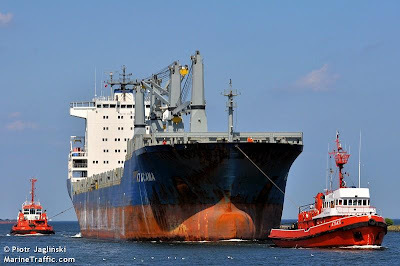 The cargo freighter "Atacama" is on its way to Cape Town with the precious cargo, due to arrive on 29 August. The map here shows its progress from the Bay of Biscay to its first port of call, Lisbon. - the stretch of good weather we've had has come to a cold and wet end. no observations taken tonight. - great observing weather for the eighth night in a row. it was clear and photometric for most of the night with seeing varying between 1.5'' and 2''. a perfect night was spoiled by tracker issues an hour before twilight. - we obtained data for the following programs. - another beautiful night in Sutherland. we had ok seeing for most of the night, an average of around 1.4''. had some tech issues during the night where we lost a couple of hours. - yet another night with very stable conditions. got two P0 targets done, otherwise it's been a very productive night. - we did only one mirror alignment. IQ was good, had sub 2'' on the guide probe for the whole evening. - very good observing conditions tonight. it was clear, low wind and photometric with an average seeing of around 1.5''. only two mirror alignments for the night which held up very well. EE50 on the guide probe matched the timdimm seeing for the whole night. - a long productive night with mediocre seeing. our night got cut short by an hour due to a TCS comms problem that we could not recover from. - long productive night with decent seeing.